The origins of the Logo are the Christian representations encompassed in the local environment. The logo was developed after months of consultation. 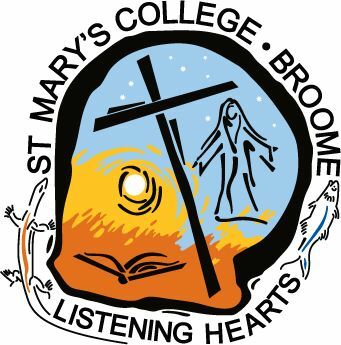 The St Mary's College Logo symbolises the land on which Broome is located as well as the ocean that surrounds us. The pearl shell displays the significance of the pearling industry for the people of Broome, e.g. their successes and their sorrows. The Cross reminds us of Jesus’ death for our salvation. Mary our Patron Saint is central to our mission and is highlighted. We also see the Book of Knowledge at the base of the Cross – the book also takes on the shape of a bird, symbolising the Holy Spirit. The life of the ocean and the land as part of God’s creation are symbolised by the goanna and fish. The sun greatly affects our whole climate. It is a symbol of God’s glory, a symbol of the Risen Christ whose face shone as the sun at His Transfiguration.